“Here, take this. I won’t need it when I get to Japan,” I said to my husband right before going through security at the airport. I handed him $300 in cash and my personal credit card, gave him a kiss and hug, and thus began my seventh business trip to Asia. International travel can be challenging, but I felt confident and calm as I climbed the airplane steps for the long journey from small-town Towanda to big-city Tokyo. Nineteen hours later, I shuffled slowly along with the other weary passengers heading for customs at Narita Airport. 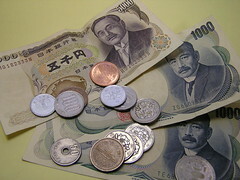 “Ten days; this is the longest business trip I’ve ever taken,” I thought as I passed by the foreign currency counter, knowing that I could get yen at the hotel using my credit card. I headed straight for the bus counter to buy a ticket for the Keio Plaza Hotel – 1200 yen or about $12, cash only. Safely on the bus, I dozed during the ninety-minute ride. “I am sorry, but we cannot do currency exchange with a credit card,” the young women at the hotel counter said early the next morning. “Rats,” I thought, “The other hotel I’ve stayed at in Tokyo would do it.” I quickly counted the cash in my wallet, finding that after paying for the bus ticket, I now had $68 left, enough for about 6800 yen. “OK”, I thought, “This won’t be a big problem; I’ll just find an ATM machine sometime today.” Looking up, I spotted Mr. Ando, our business representative in Japan and our busy day began. Up early the next morning, I decided to take a taxi to my customer’s office so that I could charge the fare rather than pay cash on the train. I carefully chose a taxi with credit card symbols on the window. When we arrived, I handed my card to the driver, but he shook his head and pointed at his card reader. It took me a moment to realize that it was broken. He needed cash! I sheepishly told my customer of my dilemma, and he graciously paid the fare. After the meeting, I walked up the street to the Royal Park Hotel where I’d stayed during previous visits, convinced that my money problems were over. “We are very sorry, but we cannot issue funds on credit cards unless you are a guest,” the lady at the counter told me apologetically. For the first time, I felt a slight wave of panic, and with a heavy heart, I parted with the rest of my yen for the train trip back to the Keio Plaza. After a good night’s rest, I awoke feeling quite optimistic, knowing that I would be able to get currency after my flight to Korea, either at the airport or at the hotel. On board the flight to Seoul, I talked with a gentleman from Indiana who was also traveling on business. We swapped stories of our work and families, plus I told him the sad tale of my cash troubles. When we left the plane, he handed me a 50-dollar bill and his business card. I didn’t argue too much with him, since it was a bit unsettling to land in Korea with only $2.40 in change in my pockets! My optimism faded at the foreign currency counter at the Incheon Airport. They required cash to make an exchange, so I could only get $50 worth of Korean won. The hotel exchange desk proved to be a bust too, requiring cash to do an exchange. Somewhat discouraged by the latest failed attempts to get cash, I nevertheless relaxed in Seoul the next day. I shopped the afternoon away in Itaewon, paying for new luggage and an antique wooden jewelry box with my company card – not per company policy, but this trip was an exception! (Yes, I did pay for these myself once I got home!). My last business day took me from Seoul on the train south to Daegu. I traveled with a business agent who spoke limited English. Since we couldn’t chitchat, I didn’t tell him about my money woes, which created new suspense. At the train station, while I was trying to decipher the credit-card-accepting ticket machine, our agent was buying my ticket with cash. He expected me to pay him back with cash. So, I gave him cash – all my cash! As we rolled on down the line, I reasoned that meals could go on my credit card and the bus to the airport in the morning was free. With that settled, I relaxed and watched the beautiful Korean countryside pass by. As we left our last customer’s office, I felt light-hearted, already anticipating the end of this 10-day adventure. Considering the events leading up to this moment, what happened next shouldn’t have surprised me. It did. When we reached the train station, our agent asked for my money for the return trip to Seoul! “You’ve got to be kidding me!” I thought. “The money that I gave you this morning was only for a one-way ticket?” I asked, my stomach starting to churn a bit. Sure enough, it was the end of the line and there was nothing left to do but beg. I threw myself at his mercy and after much hand-signaling and mis-communication, he finally realized that I was penniless. He would have to trust me to repay him or leave me stranded in Daegu. Fortunately, he paid, and I hopped on the train back to Seoul. Day ten of this adventure meant backtracking my way home; Seoul to Tokyo to Detroit to Elmira to Towanda. In Detroit during a layover, I stood in line waiting for a bagel and rummaged for the U.S. coins on the bottom of my pocketbook. Problem? The bagel cost $2.45, and the change totaled just two-forty. I turned to the man behind me in line and asked, “Do you have a nickel?” That’s Japan and Korea on $8 a day plus five cents! When I told this story to my family, they assumed that I was terribly stressed during this trip. Surprisingly though, except for a few moments of distress, I always felt that things would work out OK. And they did. Was this just due to dumb luck? I don’t think so. I believe that most people are basically kind-hearted and willing to help someone in need. Yes, I mailed money back to each of these kind souls, but I know that each helped me without total assurance of that. Trusting in the goodness of others can help us through troubled times. Now, if I only knew who that man in Detroit was so that I could return his nickel! Filled under: Japan, Just for Fun, Popular, Travel | You can follow any responses to this entry through the RSS 2.0 feed. i did not remember when you made the travel. That was so funny and frightening trip.Kume-san told me this blog.And I remember you wrote me this address.I read it with raughing.Thank you.